SESP's Nichole Pinkard (middle), faculty director of OCEP. Northwestern University’s School of Education and Social Policy (SESP) and Chicago Public Schools (CPS) launched the Rapid Impact Grants Program -- an accelerated program that will fund small projects that address pressing research needs to help inform practice and propel academic progress in the nation’s third-largest school district. The program will fund high-quality projects that can be completed quickly, align with CPS’s programmatic priorities and provide researchers and school communities with critical insights. The Rapid Impact Grants Program, facilitated by SESP’s Office of Community Education Partnerships (OCEP), is generously supported by the Spencer Foundation, the Steans Family Foundation, the Chicago Public Education Fund and an anonymous donor. During the first year, $145,000 will be available for projects. Research projects could focus on myriad challenges facing CPS, as well as school districts across the country, including questions related to improving curriculum, laying a stronger foundation in pre-K, teacher development and retention and eliminating health-related barriers to learning, just to name a few. OCEP recently distributed a request for proposals to Northwestern’s research community. Researchers were invited to submit a short proposal describing the research question, its contribution to the scholarly literature, methodology, budget, timeline and proposed scholarly and practitioner products, including data and reports for CPS. CPS and a Northwestern committee will jointly determine which proposals to fund by assessing scholarly quality, contribution, actionability, timeliness and alignment to CPS’s priorities. Awards will be announced in late October 2018. The Rapid Impact Grants program is the latest collaboration within CPS and Northwestern’s research and data partnership. The joint effort develops collaborative, mutually-beneficial projects for research and practice, and enhances CPS and Northwestern’s research and data infrastructure. Support for the Rapid Impact Grants Program is part of the University-wide fundraising campaign, We Will. The Campaign for Northwestern. Funds raised are helping realize the transformational vision set forth in Northwestern’s strategic plan and solidify the University’s position among the world’s leading research universities. More information on the Campaign is available at wewill.northwestern.edu. Northwestern’s Good Neighbor, Great University provides scholarships for CPS students that has led to 156 new CPS enrollees for the 2018 academic year. STAR Scholarships partners Northwestern with City Colleges of Chicago to offer a Northwestern STAR Scholarship Award to CPS students who complete an associate’s degree at a City College and then come to Northwestern to complete their bachelor’s degrees. In 2017, Northwestern admitted four STAR scholars from City Colleges of Chicago. In 2018, five STAR scholars will be enrolled. Northwestern Academy is a multi-year college preparation and enrichment program for diverse, academically motivated students from CPS, which has provided hundreds of low-income, academically talented CPS students with no-cost access to classes, academic tutoring, college counseling, test preparation and family workshops to help prepare them for top-tier universities. Northwestern Academy currently serves 270 students from 40 CPS high schools. 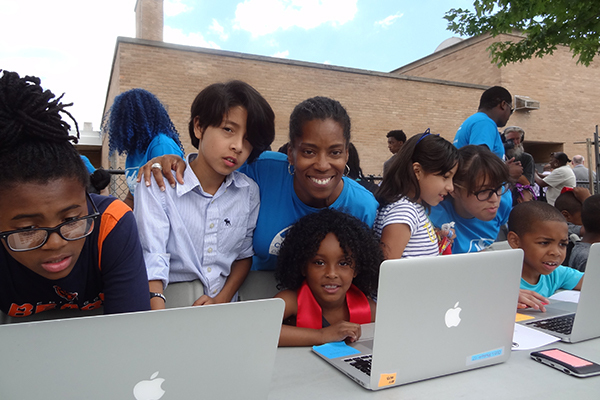 Chicago City of Learning, founded with the Chicago Mayor’s office, helps students connect and document both in-school and out-of-school learning opportunities across the city. The Baxter Center for Science Education is a partnership between CPS’s Lindblom Math & Science Academy and the CPS Department of STEM, SESP and Baxter International Inc. This program is a hub for high school and middle school science curricula, teacher professional development and resources to support authentic and innovative science programs in their schools. To date, the Center has trained 1,200 teachers from 300 schools in CPS. Lake View High School: Northwestern announced in 2017 an exciting new partnership with Lake View High School. Science in Society is working on a strategic plan to support Lake View’s educational needs. Short-term, this includes providing afterschool academic support for 9th-grade students and opportunities for teacher professional development. More recently, Northwestern hired a coordinator to work directly in Lake View High School to help implement programming. Science Club Summer Camp (SC2) was developed in partnership with the Department of Science at CPS and represents a novel, best-practices approach to training and supporting CPS teachers. The program includes more than 50 hours of curriculum-based theory and pedagogical training, followed by a two-week practicum teaching experience leading summer science camp at a local Boys & Girls Clubs site. This dual theory-and-practice model better equips teachers for success in the classroom. Now in its development phase, SC2 will train more than 60 teachers and support high-quality summer learning experiences for 400 youth. A $1.2 million federal Science Education Partnership Award from the National Institutes of Health funds the program. The Women’s Health Science Program offers no-cost science education opportunities to CPS high school female students from underserved communities who are considering careers in science and medicine. One hundred percent of WHSP alumnae go to college, and 82.5 percent are pursuing majors in the fields of science and medicine. In 2010, the program was recognized with The Presidential Award for Excellence in Science, Mathematics, and Engineering Mentoring. Medill Media Teens: Teens from the Gary Comer Youth Center on the South Side of Chicago participate in a two-year journalism and multimedia program working with Medill students who serve as mentors and teachers. The teens meet with their mentors each week in downtown Chicago to find stories and learn relevant skills that will make them competitive as they progress in school and their careers. For more information visit the website for the Office of Community Education Partnerships.